HÀ NỘI — Việt Nam and the US should sustain and strengthen their economic and trade links, as they are key to bilateral relations as a whole, Deputy Prime Minister and Foreign Minister Phạm Bình Minh said on Thursday. Minh, who is on an official two-day (April 20-21) visit to the US, was speaking during a meeting with US Secretary of State Rex Tillerson and Advisor of the US National Security Council Herbert Raymond McMaster in Washington DC. In his talks, the Deputy PM reaffirmed Việt Nam’s consistent foreign policy of independence, self-reliance, diversification and multilateralisation of relations, and international integration. Việt Nam and the US have great potential to strengthen co-operation, he said, suggesting the two sides expand links in education, training, science-technology, security-defence, and humanity, and in dealing with the consequences of war. Minh said Việt Nam was willing to work with the new US administration to reinforce and deepen the Comprehensive Partnership between two countries, based on respect for independence, sovereignty and political institutions of both nations. This would contribute to peace, stability, co-operation and development in the Asia Pacific region and the world, he said. 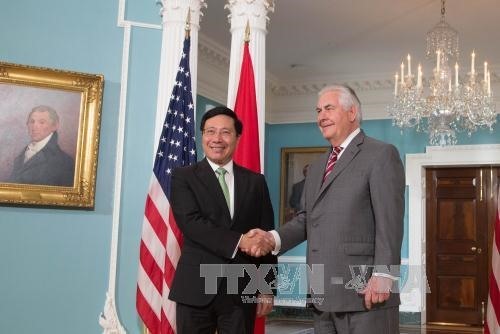 US State Secretary Tillerson and Advisor McMaster highlighted the flourishing growth of Việt Nam-US ties in recent times, and expressed their belief that the relationship will become even stronger. The new US administration attaches importance to the Comprehensive Partnership with Việt Nam, they stressed, agreeing on the need to enhance exchange visits at all levels to foster bilateral co-operation. Tillerson affirmed that the US would work with Việt Nam to ensure that the APEC 2017 brings about practical results. While comparing notes on regional and international issues, Tillerson and McMaster underlined the importance of maintaining peace, stability, security, safety and freedom of navigation in the East Sea. The US supports the settlement of disputes in the sea by peaceful measures based on diplomatic and legal processes, in line with international law, especially the 1982 United Nations Convention on the Law of the Sea and the Declaration on the Conduct of Parties in the East Sea (DOC), they stressed. At the meeting, Minh conveyed President Trần Đại Quang’s invitation to US President Donald Trump to attend the Asia-Pacific Economic Co-operation (APEC) forum in 2017 and pay an official visit to Việt Nam. Tillerson and McMaster affirmed that President Trump will attend the event in Việt Nam. Advisor McMaster also conveyed President Donald Trump’s invitation to Prime Minister Nguyễn Xuân Phúc to visit the US. Minh also met with US Treasury Secretary Steven Mnuchin on Thursday.